OMGsh, can you believe its less than 3 weeks to Christmas? 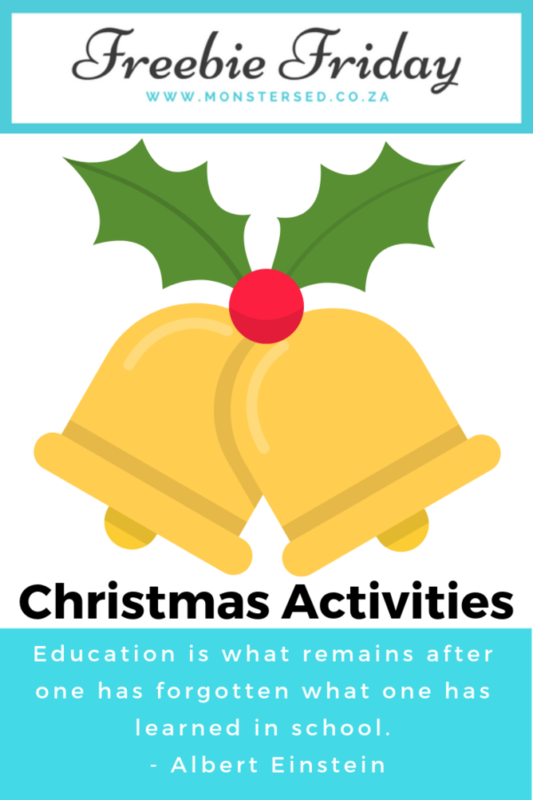 Here are some fun Christmas Activities for Kids to do during this festive season. These are great boredom busters. You can view our previous 2015 Freebie Friday Christmas Post HERE. I really love printable crafts! 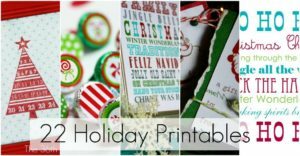 I’m a little late on my Christmas in July series, but here’s the next one up – printable Christmas paper chain templates! There’s a snowman, reindeer, angel and Christmas tree, along with easy directions on how to cut and fold the paper to make these paper chains. Tape several of them together to make cute paper garlands and decorate with glitter or paint! 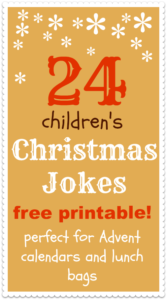 This year as well as chocolate we’re adding some giggles to our advent calendar with a Christmas jokes for kids printable. 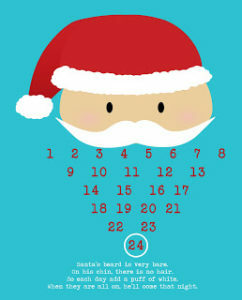 As promised, here is the Santa Christmas Countdown printable. What a great chance to get some SWEET decor and gift ideas, from some AMAZINGLY TALENTED bloggers! On one last note, WOW, we have had a record amount of links! What does that mean to you? 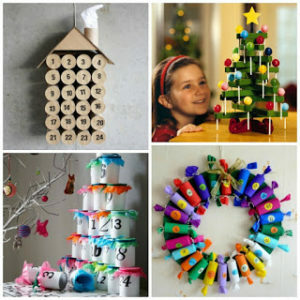 A record AMOUNT of amazingly cool Christmas Projects AND projects of every kind. Be sure to check OUT all the inspiration!! 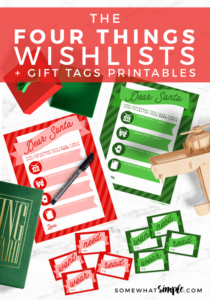 Create a simple yet darling Christmas Wish List with your kids. Give them something they want, something they need, something to wear, and something to read. Who hasn’t heard the classic poem “A Visit from St. Nicholas” by Clement C. Moore? This fun and interactive activity will have your students begging to play again and again as they try to beat their best time by reading fluently and more quickly each time. The poem has been divided into 28 cards in an “I have, Who Has” fashion. Students will have to listen carefully as they only get the 3 or 4 words in the poem ahead of their lines. 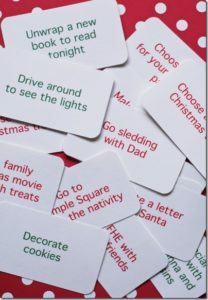 I have also listed several alternate ways to enjoy the included cards. I used this activity for over ten years in my classroom, and my students loved it every year. I am offering it as a free resource as my Holiday gift to you! Happy Holidays! Downloaded over 60,000 times! Get ready for some Christmas fun! This reader’s theatre script is designed for the whole class to enjoy. There are six main readers and four choral groups. 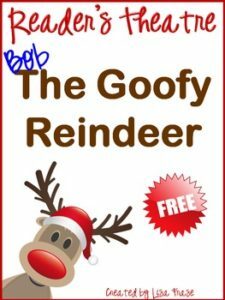 Assign parts and have a blast reading this goofy story about a reindeer named Bob! It’s FREE! The Christmas season is the perfect time to reinforce acts of kindness with children. 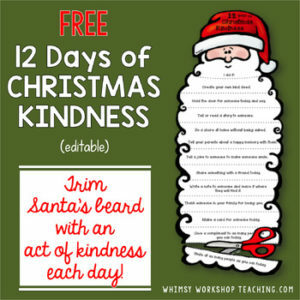 This activity prompts children to participate in a different act of kindness each day while trimming off Santa’s long beard. This kit provides a “ready-to-print” version with both color and black and white. Also included is an editable version (Power Point format) if you prefer to create your own kindness jobs that are specific to your classroom or family. Just print your own text in the blank spaces and choose your font, size and color. 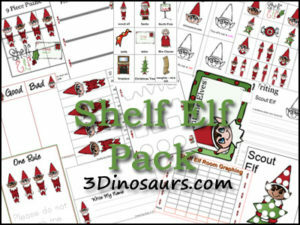 Please check out my Christmas sets, Five Little Reinder – Christmas Math & Literacy Fun. 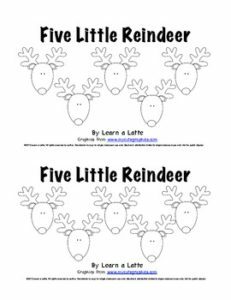 This set includes a larger color copy of the Five Little Reindeer book with high quality graphics and LOTS of great reindeer math and literacy activities including color words, number words, sight words, counting sets, writing numbers, a reindeer glyph and much more! 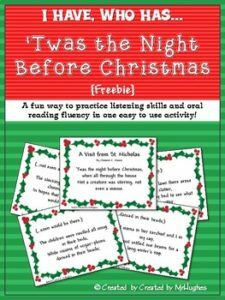 I also have a new Christmas set, Christmas Literacy Centers & Activities, that provides student practice with syllables, rhyming, beginning sounds, and short vowels. Here are 20 Fun Would You Rather Questions to use with your students. These are great discussion starters for when you have a few extra minutes. They can also be used for classroom polls or journal prompts. Your free Christmas card templates have been designed with the busy teacher in mind. 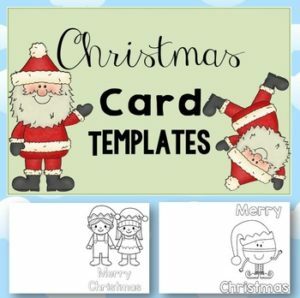 Your black and white card templates will give your students opportunities to engage in the Christmas tradition of making and giving a Christmas card(s) to a loved one or friend. Students will decorate and write on their card with the purpose of giving and brightening up someone’s Christmas. 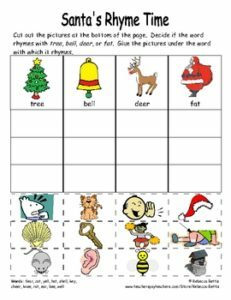 * Santa’s Rhyme Time Ã¢ï¿½ï¿½ Students sort pictures according to rhyme (tree, bell, deer, and fat). * One imaginative writing prompt/story paper. The primary lined paper contains a color illustration and space for students to draw a picture and write a story. 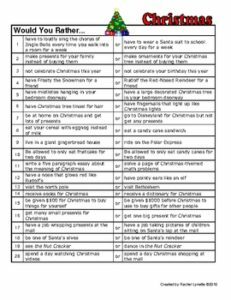 * Christmas Tree Addition Ã¢ï¿½ï¿½ A cut and paste activity in which students solve 6 basic addition problems involving adding 8. 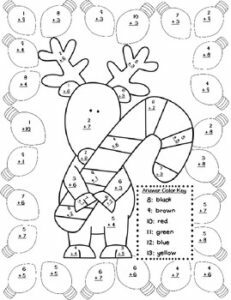 * Reindeer Counting Ã¢ï¿½ï¿½ A cut and paste activity in which students count sets of 6 through 10 dots. Fun Christmas themed color by number sheets (basic addition facts).